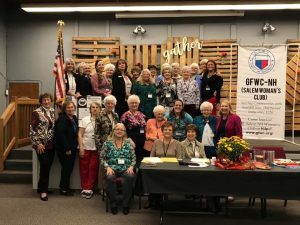 In February, the GFWC Woman’s Club of Colorado Springs (Colorado) held an event called, “A Fulfilling Luncheon” to educate and create awareness of the human trafficking issue their community and our country. Thirty members attended along with twenty-six guests which included women from other organizations such as the American Association of University Women, Zonta International, and Newcomers. The GFWC Colorado state and district presidents joined too. Admission to the luncheon was a $10 donation and specific items to fill backpacks for law enforcement to give to trafficked individuals when rescued. 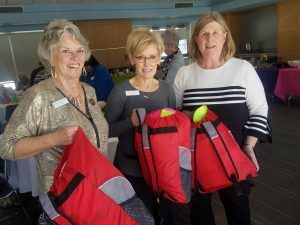 The backpacks were donated to Restore Innocence, a non-profit headquartered in Colorado Springs which provides aid to victims of human trafficking. The CEO gave an excellent presentation on the horror of human trafficking and the purpose of the backpacks. Each backpack contains a fresh change of clothes, underwear, socks, toiletries, a small blanket, and more. It takes $80-$100 to fill one backpack. The backpacks are distributed to law enforcement and the FBI locally and throughout the country to give to those rescued from trafficking. 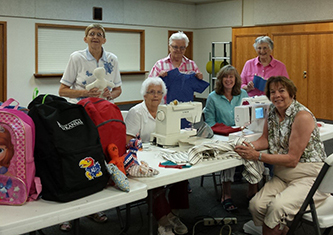 After lunch the women went down the assembly line and filled the backpacks. The generosity of the women resulted in thirty-eight full backpacks plus many extras for Restore Innocence. They were overwhelmed with joy to give this $3500 in-kind and $400 donation to such an important organization. The GFWC-NH Salem Woman’s Club (New Hampshire) is a member of their local Chamber of Commerce and has formulated partnerships with several other community outreach organizations that promote and recognize their club in their newsletters and websites. The club has been publicly thanked for several projects, including the Salem Police Department, Silverthorne Adult Day Care, Bridging the Horizons, Girl Scouts, Homeland Hero’s, Palace Theater, Dollars for Scholars, and End 68 Hours of Hunger to name a few. 42 members were involved and totaled 10 volunteer hours. This week, the Paradise Valley Junior Women’s Club (Arizona) donated 100 pairs of shoes to Soles4Souls! We’re so excited to see how many clubs have been so successful in supporting GFWC’s Cooperative Giving Project with Soles4Souls. 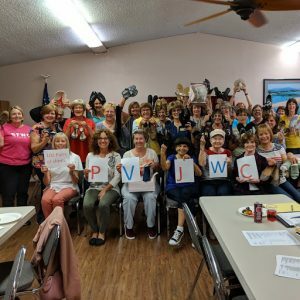 The Lake City Women’s Club (Michigan) may be on a winter hiatus, but that doesn’t mean they’re not still active in their community. 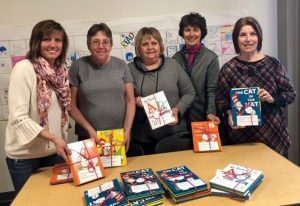 Since March was National Reading Month and also Dr. Seuss birthday, the club celebrated by purchasing 36 new Dr. Seuss books and donated them to the Lake City Elementary School as part of GFWC’s Dr. Seuss Grand Initiative. The books were separated into 13 individually wrapped presents so each of the kindergarten, first, and second grade classes would receive one. The club also donated 25 books to the “Let’s Read Lake City” program, which distributes books to local sites to improve reading skills of young children.